bl.uk > Online Gallery Home	> Online exhibitions	> Asia, Pacific and Africa Collections	> Fakers. Full-length carte-de-visite portrait of two fakirs, one of a series of prints of ethnic types and occupations taken by Bourne and Shepherd in the early 1870s. A fakir, derived from an Arab word, was first applied to a Muslim religious mendicant but later also used for Hindu ascetics or holy men. The Europeans in the 19th century could not make the distinction between Hindu and Muslim holy men and thus began to use the term for holy men of any religion. 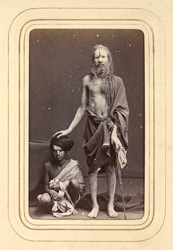 This photograph is of two Hindu ascetics.